Our daughter, Madison, has been home for winter break for the past couple of weeks, and we have been eating like a bunch of college kids! Yikes! It's been great having our better third home, but now that she's made the move to her winter internship, Don and I decided we better start eating less like a couple of college kids and more like the responsible adults we are supposed to be - boo! hiss! 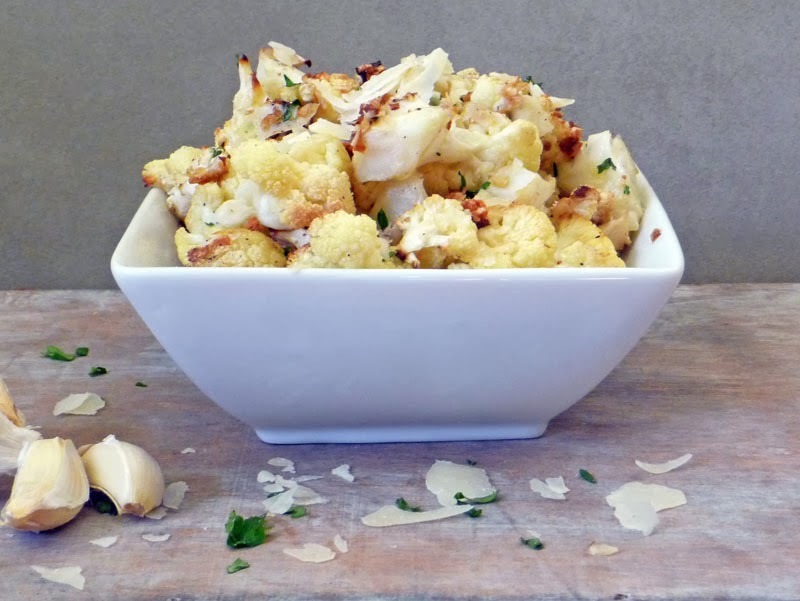 In an attempt to enjoy something healthy and tasty to go along with the NY Strips I found on sale, I made Roasted Parmesan Garlic Cauliflower. WINNER! Preheat oven to 450 degrees F. Lightly grease a 13x9" baking dish with olive oil cooking spray. I use the Misto Olive Oil Sprayer . 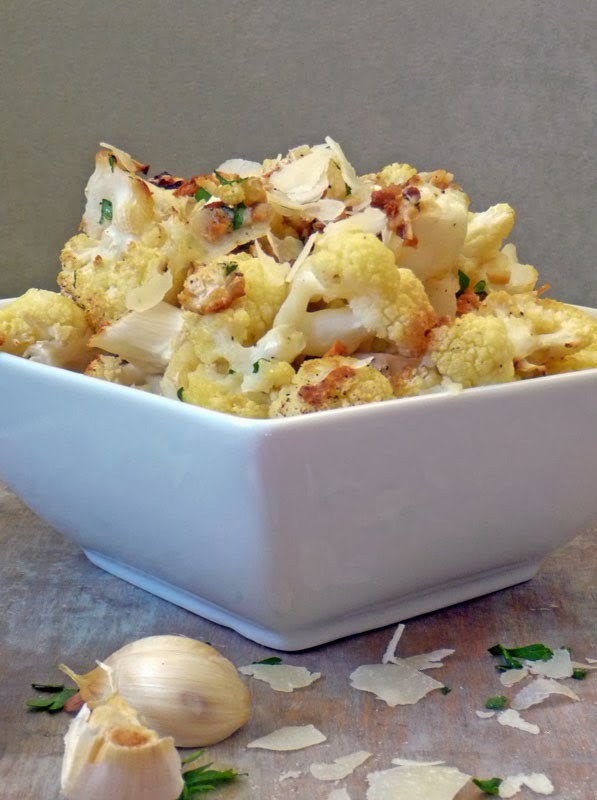 Place the cauliflower florets into the baking dish and sprinkle 1 1/2 to 2 tablespoons freshly minced garlic and 3 tablespoons olive oil over them. Stir to coat. Season with salt and pepper. Bake for 25-30 minutes, stirring after about 12-15 minutes. Top with 1/3 cup Parmesan cheese and 1/2 to 1 tablespoon chopped fresh parsley. Broil for 3-5 minutes or until golden. Those look fabulous! Gotta try! I could eat these all day long! Happy Holidays, Linda!! HI Marion! This looks wonderful. 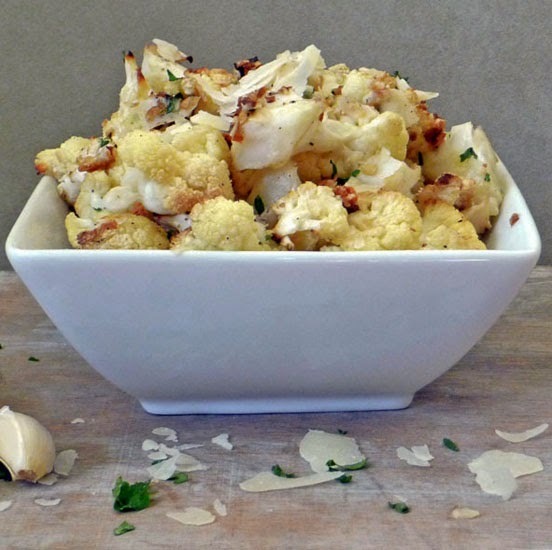 I love cauliflower and love how you dress it up with all the seasonings and cheese. You take a bland veggie and turn it into something really delicious!! Great post! Cauliflower was so ignored in my house, but I've since learned how to addd different flavors and can't eat enough of it! Can't wait to try your recipe. Sounds delicious!! Thanks, Sandra! It is a favorite in our house - I love to snack on this! !